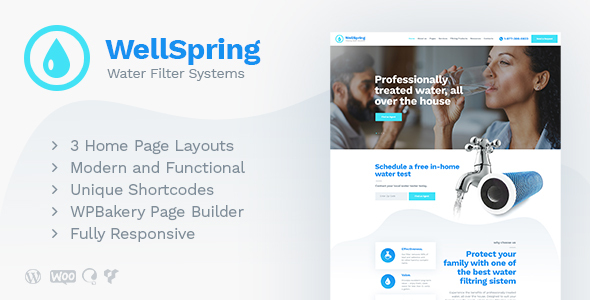 WellSpring is a modern, fresh & clean web solution for water filtering company, home water filters, drinking bottled water delivery company and a store of water filters and supplies. It is great for water supply company, plumber, cleaning services, electric & energy company, solar systems installation and maintenance handyman. Also it fits a plumbing or carpentry firm website. Basically, it can fit any home repair and maintenance business. So it’s quite multi-functional. WellSpring is also a great solution for water supply shop due to its full Woocommerce compatibility. It is also compatible with WPBakery Page Builder (aka Visual Composer). The theme has an intuitive visual interface and informative layout. Attractive galleries integrated due to Essential Grid allow you to showcase your products and services. Using the Booked Appointments plugin you can manage an online appointments with a handyman. With lots of powerful features, WellSpring will definitely satisfy your needs. The theme is compatible with such awesome plugins, as Slider Revolution, Essential Grid, WPBakery Page Builder (for creating any layout at your taste)., WooCommerce to sell online. The theme is fully responsive and 100% Retina-ready.